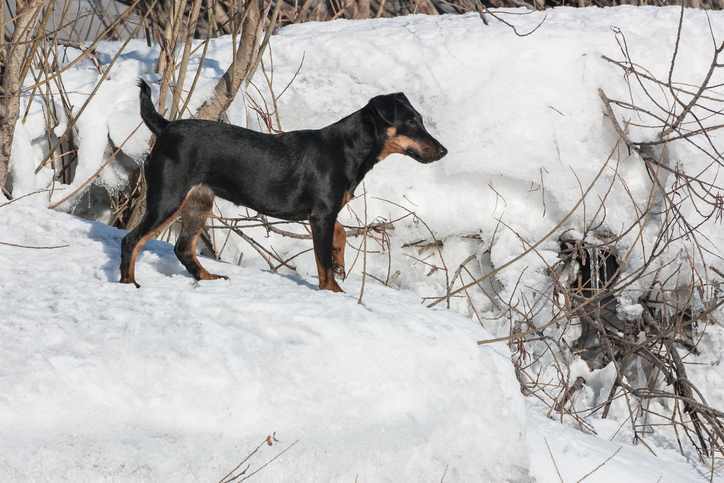 The German Hunting Terrier are not the first thing that comes to mind if you’re looking for a companion or lapdog but they are gaining in popularity even among non-hunters. Through and through, these dogs were developed to be all-around hunting dogs, but they can make an excellent, affectionate pet as well. Many names, one dog breed, you will see this breed also referred to as the German Hunt Terrier, German Hunting Terrier, or Deutscher Jagdterrier. Jagd is the German word for the hunt, and hunting is what they do best. Developed in Germany between the two world wars, breeders were determined to create a German version of the Fox Terrier. Historically these energetic, hard working pooches were used to go underground to hunt badger, fox, and raccoons but they were also good at driving wild boar and rabbits out of hiding areas and could double as a “bloodhound” locating wounded animals such as deer. They have also been known to take on the occasional bobcat and cougar. This little dog stands only 13 to 16 inches (33 to 41 centimeters) and weighs in at 20 to 22 pounds (9 to 10 kilograms), 17 to 19 pounds (8 to 9 kilograms), for females, but what it lacks in size is made up in courage, adaptability, and intelligence. This little guy (or gal) is bold and tenacious taking on any job assigned with gusto. So, is the Jagdterrier the right breed for you? Before choosing a dog, it is always helpful to research breed traits. Choosing the right breed for you will make all the difference in the world. Good with other pets: No. They prefer to be the only dog in the house, and due to their strong prey drive, you can not trust them around other small pets such as hamsters or gerbils. The Jagdterrier can have a wiry coat or a short smooth coat. To understand the history of the Jagdterrier, one must appreciate German history during the period between the two world wars. It was a period of Germany’s obsession with nationalism and superiority along with a fascination for genetic engineering and Hitler’s notions of pride, perfection, and purity. 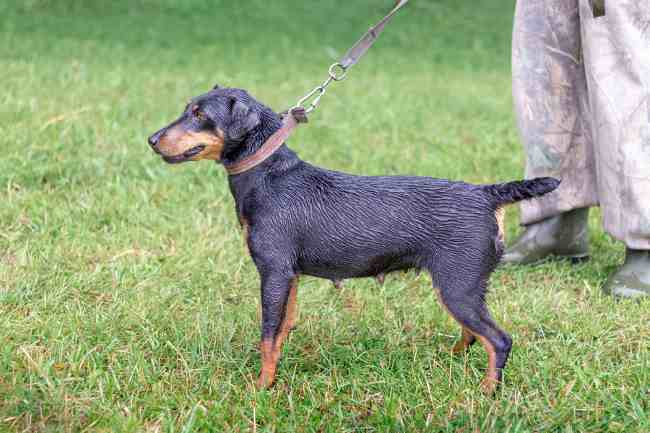 Put next to the culture of the day, some hunters wanted to create a perfect German Hunting Terrier, one that would be superior to the British and American terrier breeds. Fox Terriers were extremely popular at that time and thanks to Crufts and Westminster Dog Shows. As the fox terrier became much of a show dog, many of the sound qualities for hunting were being lost. The fox terriers were being bred for attractiveness, and the standards of the ring, the other characteristics needed for hunting such as an excellent acute hearing and vision, endurance and persistence were becoming less prominent. This first group of hunters broke away from the German Fox Terrier Association and embarked on a mission to create the regain the hunting characteristics of the fox terrier and by doing so would develop a purely German hunting terrier. These men were Walter Zangenberg, Carl Erick Grunewald, and Rudolph Friess. The hunters partnered with Lutz Heck, the curator of the Berlin Zoo. He had a peculiar quest to bring back extinct breeds that were mentioned in the mythology of Germany. So, long before Juristic Park became a favorite movie, Heck tried to bring back the extinct aurochs which were a kind of wild cattle seen in cave paintings at Lascaux France. He was also known for trying to recreate the Tarpan, a primitive pony and the quagga an extinct zebra. Another involved in the project was Dr. Herbert Lackner, a famous cynologist who helped breed for specific characteristics. Unlike most breed development attempts, this one was run with strict control and on a large scale. Hundreds of dogs were kept at the kennels, and those that did not fit the blueprint were culled. The foundation stock consisted of purebred fox terriers, but breed historians believe the Welsh Terrier, and Old English terrier was part of the mix. It took them ten years to develop a breed that was true to type. It was a dog that had a strong desire to hunt with good vision and scent lack of fear and the wiliness to obey their owner. 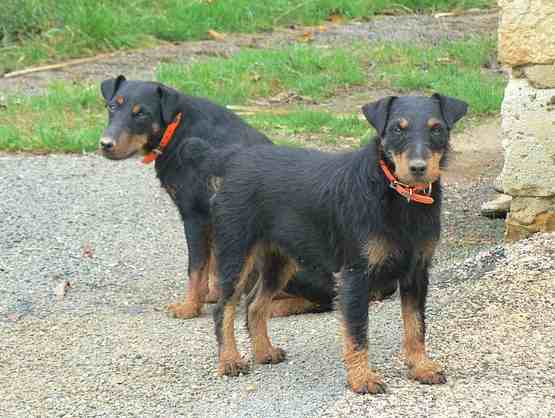 The German Hunting Terrier Club was formed in 1926 and then introduced to the public a year later. World War II took an enormous toll on the breed, but breed enthusiastic were determined to restore the population. By 1951, there were only 32 Jagdterriers from nine litters left in Germany. Hard work and determination paid off, and by 1956 there were one hundred forty-four puppies and from there the breed to gain in popularity. The U.S. gained its foundation stock around 1954 with the help of two men. Max Thiel, Sr. purchased two females after the war, Asta vom Mairhof and Naja von der Kammlach and then immigrated to the U.S. in 1951 bringing Naja with him. 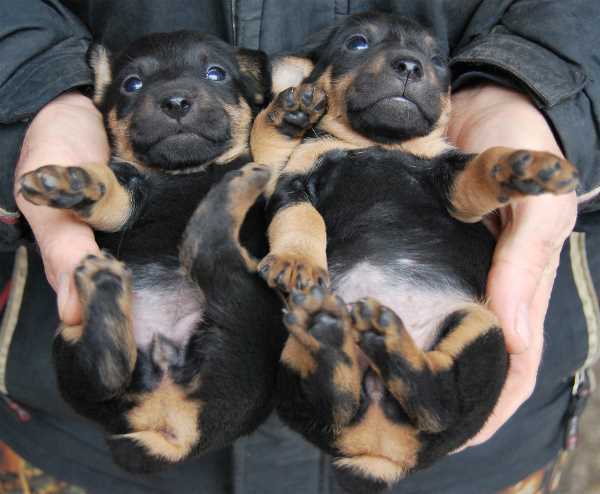 The other girl was pregnant when she arrived and gave birth to the first Deutscher Terriers on U.S. soil. Armin Schwarz Sr. then imported Axel vom Elsterbusch, a Champion male who sired several litters. Between the two men, the American bloodlines were established. It was a slow start and did not gain popularity at first. It wasn’t until just recently in 2009 that an Irish immigrant, Ray E. Delaney restarted the now defunct JTCOA (Jagdterrier Club of America). The club’s goal is to preserve the breed’s traits and original working abilities without the need for show lines. It has been slowing gaining in popularity, mostly by hunting enthusiasts. Today, the American Kennel Club as accepted it into its FSS and assigned to the terrier group. The breed retains the FCI breed standard as of this writing. 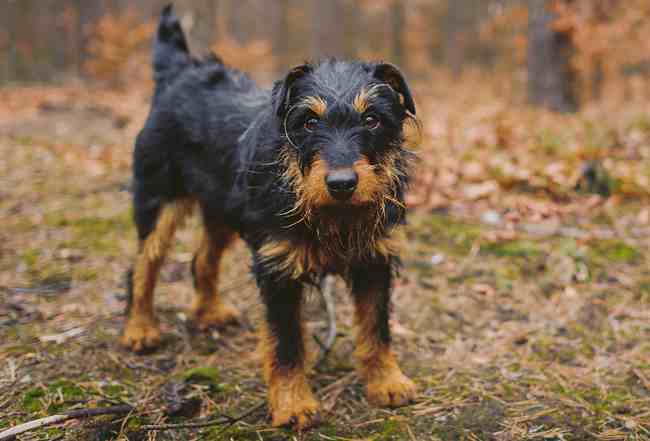 The German Hunting Terrier is bold, strong-willed, and intelligent. The Jagdterrier is an energetic, playful dog that gets along well with people, including children. They love to play and will not tire easily making them an all-around great playmate for active children. They are also gentle and patient so you won’t need to worry about things getting out of hand. They can be protective so socialize them at an early age to differentiate friend from foe. Without children, it is up to the adult who owns this breed to keep him stimulated and give him an outlet for all that energy. They would not be a good choice for couch potatoes or anyone who could not keep up with him. They thrive on daily walks (or jogs), active playtime off leash, and a rigorous game of fetch. Their size makes them a candidate for living in an apartment, but their barking tendency and the energy level may preclude apartment living. Luckily, these dogs are eager to please which makes them relatively easy to train. With that said, they can be willful, so some training techniques are more successful than others. All training sessions need to be short because they are easily distractible. Jagdterriers like variety and challenge so they won’t respond well to repetition, but as with all dogs, a positive approach works the best. Consistency is the key yet keep the sessions varied, and you’ll have an eager student. Socialization from an early age is critical, and enforcement of the house rules is necessary. They may be easier to train than other small breed dogs, but they are not recommended for first-time dog owners. An experienced person who has some training knowledge and experience makes the best owner for these dogs. Socialization should include meeting as many different types of people as possible and the introduction of other dogs, so he doesn’t become dog-aggressive later in life. New situations, new places, and new things are all critical to the socialization process. The best time to socialize is when the puppy first comes home. But don’t stop once the puppy becomes an adult. They are not known to be quiet dogs. They like to bark whether it is to get your attention, find a way to disagree with you, or just plain enjoy the sound of their own voice. They also use their voice to alert you to visitors or others passing by. As dogs go, these may be one of the best watchdogs you can own. With all of this said, this breed is not as vocal as some other terrier breeds. Here's a wet Jagdterrier ready for the hunt. The German Hunting Dog is a terrier which means most of his grooming needs will be very similar to other wiry haired terriers. The Jagdterrier, however also as a smooth coat version. The wiry coat is more time consuming to groom than the smooth coat. He will need to be brushed weekly using a pin brush (Wiry coat) or combed with a steel greyhound comb. You can use a bristle brush on the smooth coat. The breed is only a moderate shedder but the dead hairs that might typically be shed stay with the coat. This needs to be attended to about twice a year. Plucking out the dead hairs or stripped as it is often called should be done. However, most pet owners prefer the coat shaved or clipped. This is a fast and less expensive option to stripping which takes considerable time and costs much more. They don’t need frequent bathing, and often if they get dirty, you can wipe them off with a clean cloth. Bathe only when your dog is filthy or have a terrible smell. Their nails will need to be clipped regularly or filed using a grinder. Teeth should be brushed and ears checked for waxy buildup. 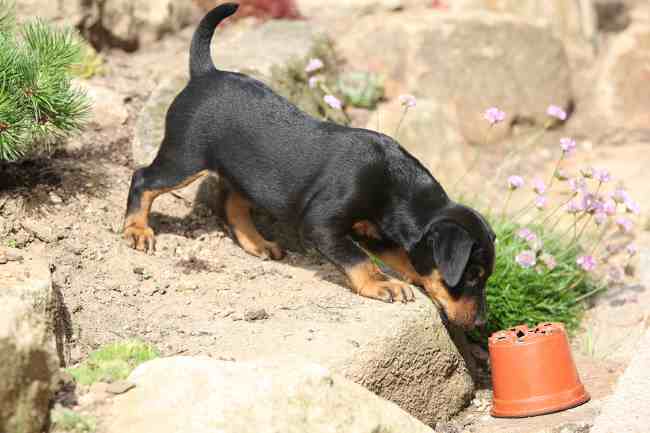 This German Hunting Terrier puppy is bold, curious and fearless. The Jagdterrier is a very healthy breed, but just like all dog breeds, they have been known to acquire some genetic issues. Even the list may seem long, please understand that most Jags never develop these problems. It is still good to be aware of potential problems. One way to avoid as many as possible to search for a reputable breeder that screens and tests for genetic issues. A common problem in this breed is Primary lens luxation or PLL. This issue develops typically in the prime of life, between 3 and 8 years of age and can be very painful. This eye problem occurs when the ligaments that hold the lens in place begin to break. This leads to the dislocation of the lens of the eye. This is not the only eye problem that can develop in Jagdterriers. Cataracts and glaucoma have also been reported.